Senior physician Ihsan Georgy drafted Mubarak's latest medical report on Tuesday confirming that the former president does not need to be transfered to intensive care, but will require medical attention or else his life will be put in danger. 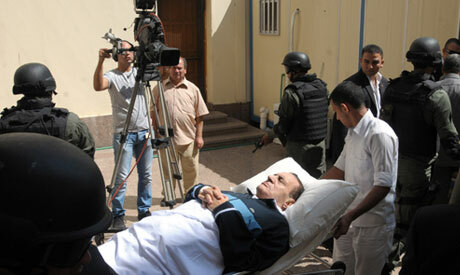 Mubarak suffers from a coronary heart disease, low blood pressure and experiences occasional fainting. He is also required to stay in a sitting position to avoid vertigo. The medical report stated that theTora hospital was sufficiently equipped for Mubarak's health needs, and that he would not need to be transferred to a military hospital or an international medical center. It, however, clarified that the former president needs direct medical supervision. According to the report, Mubarak's condition is not so serious to the extent that he cannot recognise people well, talk with them or stay focused. The former president has been moved back and forth from prison to military hospital a number of times. In recent days, he had been residing in Tora hospital. Mubarak is currently facing a prison sentence on charges of participating in the killing of protesters during the 18 days which led to his ouster.